If your pooch is friendly with strangers and other dogs, come join us for an interactive off-leash social play group. You and your pup will work on building and maintaining your communication and obedience skills. Enjoy learning and watching your dog play in a safe indoor controlled environment. You'll want to wear your tennis shoes to these classes! If your dog is friendly with strangers and other dogs...Come join us for an interactive off leash social playgroup, in a classroom setting, maintaining and building on your communication and obedience skills. 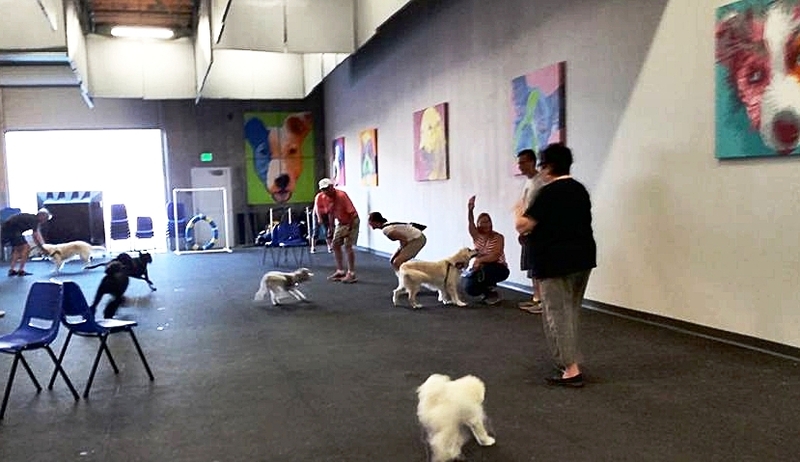 Enjoy learning new skills and watching your dog play in a safe indoor environment. Wear your tennis shoes to this one! Walk-In's are allowed with either prior approval by a Dream Dogs trainer or participation in previous romps. If your small dog is friendly with strangers and other dogs, come join us for an interactive off leash social playgroup in a classroom setting. Maintain and build on your dogs communication and obedience skills while learning new skills and watching your dog play in a safe, indoor environment. Wear your tennis shoes to this class!